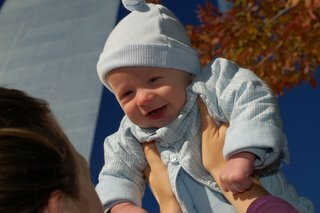 Yesterday we went downtown to the arch for a photo-shoot of sorts. There is a nice park by the arch with trees and grass, and the Fall colors are cool. We went at the end of the day when the light is low and lights up the colors on the trees. Tomorrow I (Ryan) get to watch Dylan because our babysitter canceled. I'm glad that my first reaction was excited to get to spend some time with him rather than annoyed that it will cut into the work I planned to do. Someone today told us we are good parents because we didn't micromanage Dylan and were comfortable with other people being competent to hold him, give him a bottle, etc. Thanks! 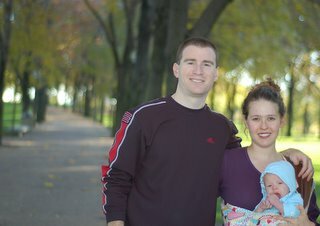 New parents need compliments!